Community inclusion of people with disabilities and aging challenges will be an ever-pressing need with the emerging number of people diagnosed with Autism and early stage Alzheimer's disease, just to name two prominent, emerging disabilities. As we have learned from the enormous price tag on historical institutionalization of people with developmental disabilities and mental health challenges, the cost of social segregation will be extraordinary in the coming decade without proper advancement of social acceptance of the aforementioned emerging populations. CIS holds the view that current inclusion techniques and systemic support are inadequate to properly integrate people with disabilities and aging challenges into society with a certain level of social acceptance. Many people with disabilities in community-based day services are now physically integrated yet remain socially isolated due to staffing ratios (typically 1:3 to 1:6) which, when even slightly mismanaged, can be off-putting to the public; there is also a lack of staff training and/or sophistication in brokering or facilitating social participation/acceptance; most staff doing this critical work are paid at minimum wage or just above. CIS has inverted its business to make serving people with disabilities more "incidental" rather than primary. This is reflected in our ratios of people with developmental disabilities to our overall census of population served. Our LAUSD adult school classes welcome typical adults and seniors to sit alongside people with disabilities and aging challenges. CIS places a premium on presenting people with disabilities in "good taste" with clothing that fits, matches and is fashionable to the season. The CIS Activities Center is an elegant, clean vessel of dignity and respect for people of modest means that are observed by community in the environment. Our integrated drama program is a showcase best practice; it exploits the talents of participating actors with disabilities and aging challenges as they work alongside typical community actors and actors of various cultures. We transport people in "unmarked vehicles" so that people served have the same "transit identity" as a typical community member that moves about town gracefully. Our adults are never transported "in herds" on donated yellow school buses (infantilism or juvenile identity advancement). Our website will never display 50 people with disabilities waiving to the public (community organization that is inandofitself an institution). 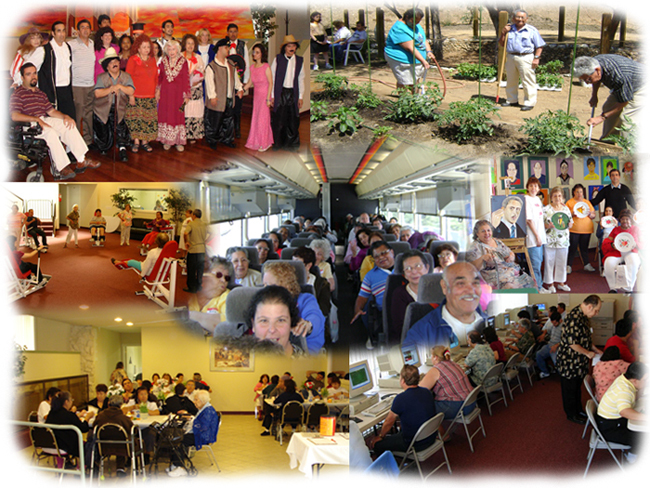 Our organization will never have one department set aside for "community integration." 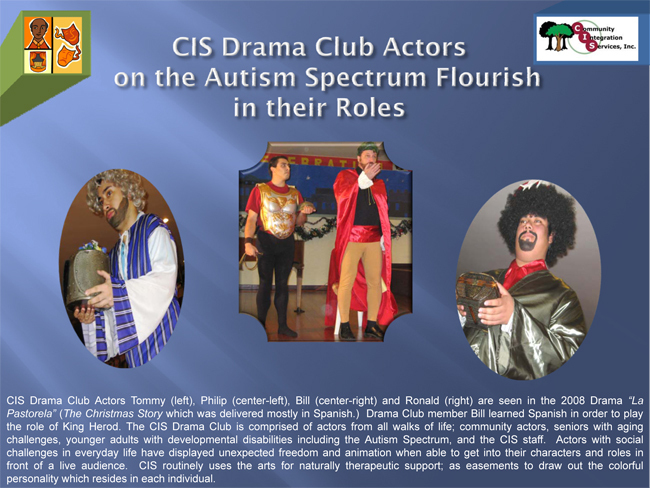 CIS aspires to a brand of social inclusion would provide satisfactory staff support to assist people with challenging disabilities to actively participate in the community in meaningful, productive ways. Society requires exposure that presents people with disabilities in "embraceable" fashions and assists people with disabilities to shed stigmas and eliminate longstanding labels, such as "patients" and "the domicile", and more recent denigrating identities such as "consumers". Personal identity development is important in the community to overcome inherent barriers of confidentiality and privacy laws. While such regulations as the Health Insurance Portability and Accountability Act (HIPAA) were meant to protect people's privacy, such institutions also tend to separate people with disabilities from others in our society; the net result is that protection of privacy, in effect = shame of condition. This shame can only be removed with proper exposure of people with disabilities in a personalized, favorable light. Potential funders of CIS (and other non-profits that serve people with disabilities) must begin to understand that just serving a certain number of people per dollar granted is not going to achieve the ultimate desired result of community integration. The money granted must begin to drive longstanding community programs toward community inclusion of people with disabilities as the chief, compelling value. This often will cause an agency to serve less of a targeted (disabled or challenged) population as a measure of including that population gracefully in programs and typical society at large. We must shake the status quo and start climbing a different ladder of success.